Strangely, ducks aren’t cooperative when it’s time for picture-taking. Here they contemplate which way to run. 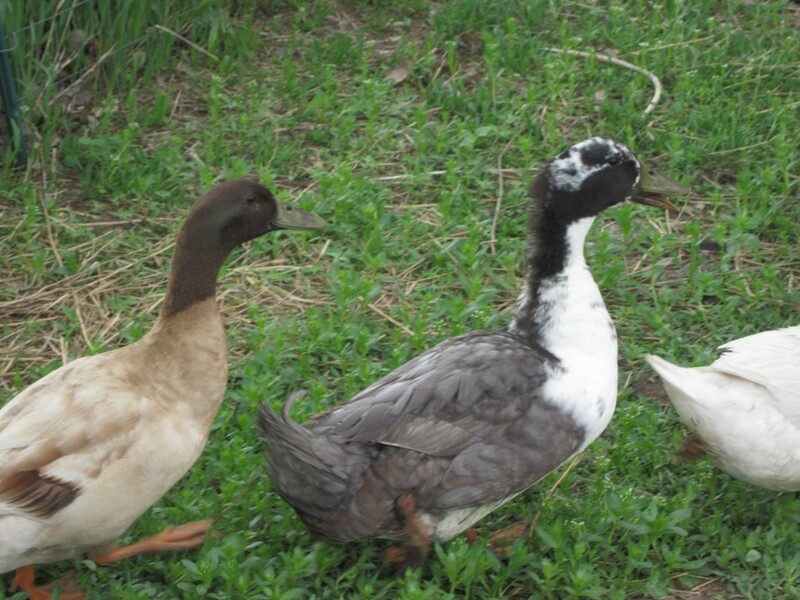 Years ago, when I had my first flock of ducks, I got up one morning to give them their feed and their water and I discovered, to my dismay, that my lovely flock of ducks was gone. They weren’t in the coop; they weren’t in their yard. I searched frantically, imagining the worst. We’d had plenty of problems with various predators killing our chickens. But twelve fat ducks is a lot to eat all at once, even for a hungry fox. Plus, there was no evidence of foul play. No pile of feathers, no pitiful broken duck bodies. As I stumbled about the duck yard, searching for answers, I heard noises nearby: the sounds of content ducks splashing about. Of course! 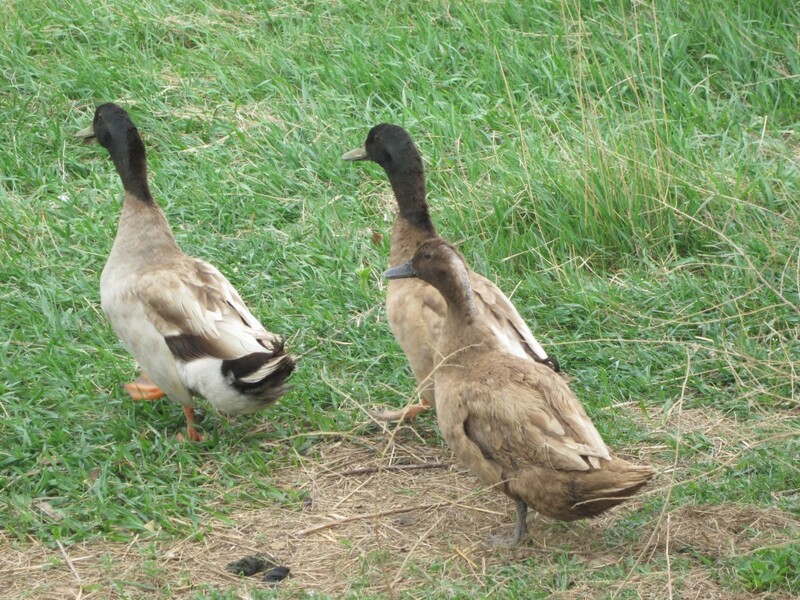 They were attracted to the water—they were water fowl, after all—and had discovered our little pond. I rushed down to the edge of our little pond and took in the beautiful sight: all twelve ducks, swimming, floating, splashing, bathing. I’d never seen such a picture of contentment. Rightness. Appropriateness. They belonged there. But how long would they survive there, rife with predators as our place is? I decided right there that I’d allow my ducks the freedom to spend the daytime hours down in the pond, and when the sun went down, I would expect them to head up to their little house, where they’d waddle in, single-file, and I’d shut them in. They’d be safe from the fox, the coyote and the skunk, all of which seemed to prefer to do their pillaging during the night time hours. During gardening season, they could take a shift or two every day clearing away the grasshoppers in my garden. Perfect! And so easy, too. It should have been easy, anyway. My chickens automatically go into their coop every night as the sun goes down, so there is no reason my ducks wouldn’t do the same thing, I figured. Self-preservation, survival of the fittest, and all that jazz. Right?
. . . they take off! Wrong. Ducks are not chickens when it comes to common sense. 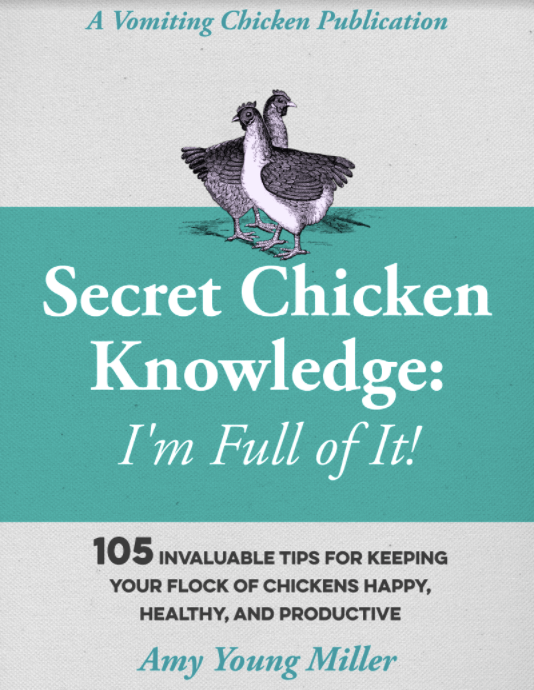 Not that chickens are all that bright, in my opinion. The sun went down and the moon came up, and my chickens lined up obediently and filed into their coop and hopped up onto their perches, tucked their heads under their wings, and fell asleep. My ducks, happy as anything, showed no signs of following their sensible cousins’ example. They continued to float quietly on the pond, unaware of the hungry predators poised to eat them, crouched behind every tree, bush and shrub. I could imagine the narrowed eyes of predators all around the pond, biding their time. . . while the party fowl on the farm kept up their splashing and rejoicing down at the water. Flashlight in hand, I tried to call those ducks to me. They loved me with passionate devotion, after all . . . didn’t they? Or was it that they loved the fact that I fed them every day. “Heeerrre, Duck, Duck, Duck. . .” They ignored me. I resorted to bribery and tossed bits of treats into the pond close to them, hoping to grab them as they came close. They floated farther from me. I walked around the far side of the pond and tried to scare them out. They regarded me with suspicion and narrowed their eyes in a mean, baleful way. Who knew ducks could be so stubborn? My family is so good to me. They must really love me, in spite of everything I drag them through. The truth is, if they would have ignored my pleas for help that night, the ducks probably would have been killed en masse by a very happy fox or two. Bryan had assured me that they would come to their senses and head up to safety before bedtime, but every time I’d go out during that evening and direct my flashlight beam towards the pond, I could tell that they were intent to stay right where they were, thank you very much. They actually appeared to be grinning at me in the flashlight’s beam. Finally I begged my family to help; they heaved great sighs, grabbed weak flashlights and jackets and followed me out to the pond, willing to help me with one more bit of foolishness. We have a little row-boat. I sent the two big boys out in the row-boat with an extra oar, with instructions to herd the ducks to shore with that extra oar. (“C’mon, boys, it’ll be fun! Boating at night! What could be more adventuresome?” They grumbled a few ideas, but I couldn’t make out what they said, exactly. None of their ideas included ducks, I’m fairly sure of that.) 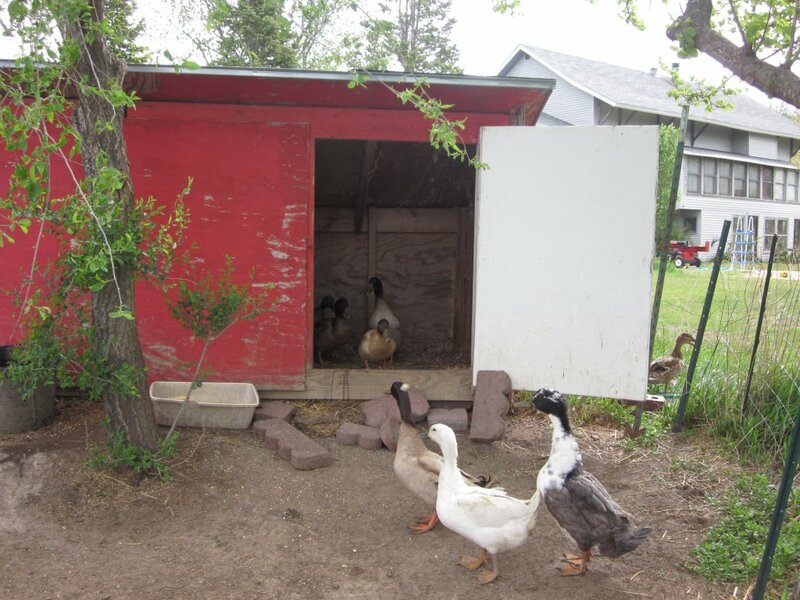 My plan was to then direct the ducks up to their coop, lock them in, and voila! Safe ducks. Live ducks. Happy ducks. Happy me! Ducks are, after all, very easy to herd. If you’re following a line of ducks and raise your left arm, for example, they’ll veer right. If you lift your right arm, they’ll veer left. All in a tidy little row. Easy! It would work. It had to work. It didn’t work. I watched from the shore, trying to guide the boys with the flashlight. We tried again and again to get the ducks to shore, but ducks are even—I’m convinced—stupider than chickens, which hardly seems possible. After several dizzyingly-frustrating attempts at this scheme, I was almost ready to kiss my ducks good-bye (from a distance) and go inside and have a good cry. Forget the garden. Maybe we could eat grasshoppers, instead of organic lettuces, tomatoes, and corn. Grasshoppers fattened on organic lettuces, tomatoes, and corn. Plenty of people do, probably, in other countries. And then–they go the other way! I’m not sure if I was more embarrassed or relieved when my dad showed up, his waders in hand. Apparently he had called while the boys and I were out frolicking in the moonlight with the ducks, and Bryan had described what his harebrained daughter was doing. 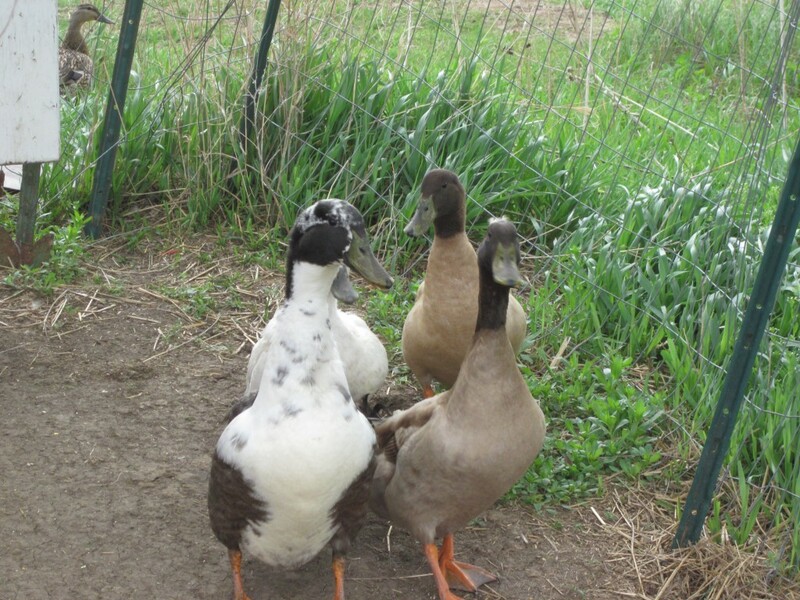 Dad knew how foolish I was about my ducks, and he’s pretty foolish about me (thank goodness!) so he headed out to help. Mom came, too, so she could laugh until she sank down on the bank and cried, which she did, especially when Dad got in too deep and filled his waders with very cold pond water. This wasn’t his intention. It seemed that the two-branched herding approach—the boys in the boat, me on the bank—just wasn’t enough, but the three-branched approach—adding Dad flailing about in the pond in his waders, to the mix—was just enough to propel those ducks onto land, and to safety, which it did. We sighed, tiredly, and followed that orderly line of waddling ducks up to the coop, shut them in, and if we would have had champagne handy, and if we hadn’t have been exhausted, and if most of us wouldn’t have been underage, we would have toasted the latching of that door. The flashlights lasted just long enough for us to help Dad peel his waders off and cluck our tongues sympathetically at his soaked clothing. The gales of laughter would have to wait until Dad and Mom were safely in their vehicle and on their way home. I wouldn’t have wanted to hurt my Dad’s feelings for anything, all things considered. I loved this story!! Reminded me of my ducks when I was a kid at home. 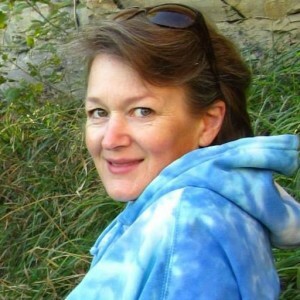 (we must have had a more educated group as they would come up to the house and sleep on the porch at night, plus we had a Mother Goose that would hurdle them in). So, was that the end of their beach vacations or…..??? I’m honored that you found the time to read it! I guess I should have told a “rest of the story.” I think I remember herding them up the hill to their house a few more times before they GOT it, and then they took better care of themselves and settled into the coop at night, too. Took them awhile to learn their lesson, though, and whenever the moon was full, I would know that nothing would get them in! I howled with laughter! Our ducks made friends with the guinea fowl up the road and they used to take turns visiting each other! Caro, That is cute! I’m a little surprised that they were interested in each other! Thanks for your kind words. Thanks Cheryl! I’m glad you enjoyed it. I needed that good laugh today, trying not to choke on my lunch. I love your descriptions and imagery, you really captured me. We had a similar funny/sad duck story. A mama duck and her dozen ducklings took up residence in our backyard swimming pool (instead of the nice ponds nearby). The babies couldn’t get out because of the rock edge of the pool. So we tried scooping them out with a net. Ducklings are quick as lightning! We built a ramp, they loved it and practiced going in and out of the pool. Once we finally herded them out to our yard, they went all the way around the other side of the house, back under the fence and into the pool. It wasa long comedic afternoon of scurrying after this family! Thanks for telling me your story. I love the way little ducklings move, too, and it always strikes me as a bit of a miracle that baby ducks can swim so well practically as soon as they hatch! Loved the story. I was raised on a farm and it was always an adventure with the animals. Isn’t that the truth, Leslie? When you have animals, you always have a story to tell. Thanks for reading! Do you still have to heard them in every night? Or are they getting the hang of it now? Diane,I’m realizing that I really left everybody hanging! I did have to herd them up for another night or two, but then they learned their new habit, and they went up the hill and into the coop by themselves and all I had to do was latch the door for the night! Yay! Debbie, we’re still laughing it and it was several years back! Thanks so much for reading. So good of you to read my story, Gord. Glad it made you laugh!